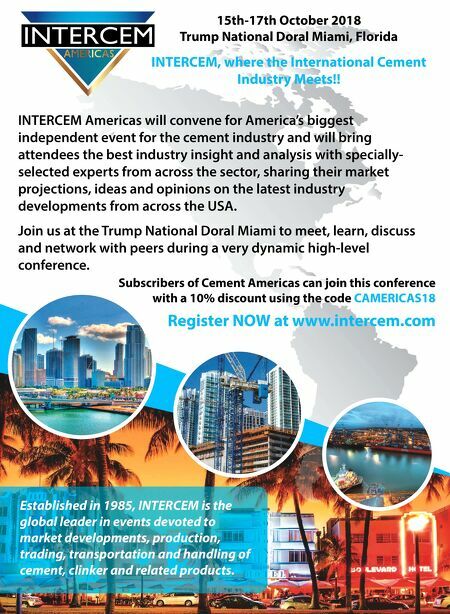 14 CEMENT AMERICAS • Fall 2018 • www.cementamericas.com CEMENTSCOPE TRANSFORMING THE WAY THE WORLD WORKS Over 2 million vehicles use Trimble transportation technology, learn more at trimble.com/tcl, call +1.480.489.2270, see us at booth 404 Better intel equals better decisions equals better productivity equals better business. 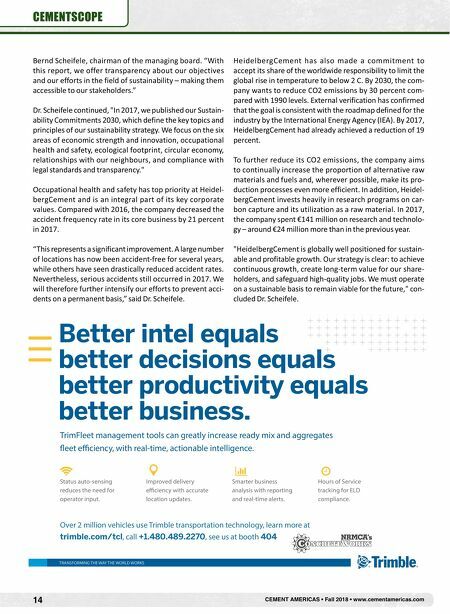 TrimFleet management tools can greatly increase ready mix and aggregates fleet efficiency, with real-time, actionable intelligence. Status auto-sensing reduces the need for operator input. Improved delivery efficiency with accurate location updates. Smarter business analysis with reporting and real-time alerts. Hours of Service tracking for ELD compliance. Bernd Scheifele, chairman of the managing board. "With this report, we offer transparency about our objectives and our efforts in the field of sustainability – making them accessible to our stakeholders." Dr. Scheifele continued, "In 2017, we published our Sustain- ability Commitments 2030, which define the key topics and principles of our sustainability strategy. We focus on the six areas of economic strength and innovation, occupational health and safety, ecological footprint, circular economy, relationships with our neighbours, and compliance with legal standards and transparency." Occupational health and safety has top priority at Heidel- bergCement and is an integral part of its key corporate values. Compared with 2016, the company decreased the accident frequency rate in its core business by 21 percent in 2017. "This represents a significant improvement. A large number of locations has now been accident-free for several years, while others have seen drastically reduced accident rates. Nevertheless, serious accidents still occurred in 2017. We will therefore further intensify our efforts to prevent acci- dents on a permanent basis," said Dr. Scheifele. HeidelbergCement has also made a commitment to accept its share of the worldwide responsibility to limit the global rise in temperature to below 2 C. By 2030, the com- pany wants to reduce CO2 emissions by 30 percent com- pared with 1990 levels. External verification has confirmed that the goal is consistent with the roadmap defined for the industry by the International Energy Agency (IEA). By 2017, HeidelbergCement had already achieved a reduction of 19 percent. To further reduce its CO2 emissions, the company aims to continually increase the proportion of alternative raw materials and fuels and, wherever possible, make its pro- duction processes even more efficient. In addition, Heidel- bergCement invests heavily in research programs on car- bon capture and its utilization as a raw material. In 2017, the company spent €141 million on research and technolo- gy – around €24 million more than in the previous year. "HeidelbergCement is globally well positioned for sustain- able and profitable growth. Our strategy is clear: to achieve continuous growth, create long-term value for our share- holders, and safeguard high-quality jobs. We must operate on a sustainable basis to remain viable for the future," con- cluded Dr. Scheifele.